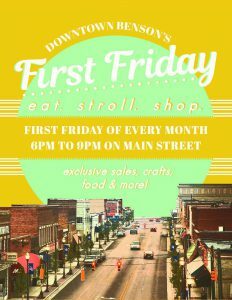 Visit Downtown Benson for its monthly First Friday event. Participating shops will remain open until 9 p.m. Some shops will offer light refreshments (i.e: wine, beer, etc.) DIY projects, crafts or an exclusive First Friday sale. There will also be a food truck set up in Benton Square.